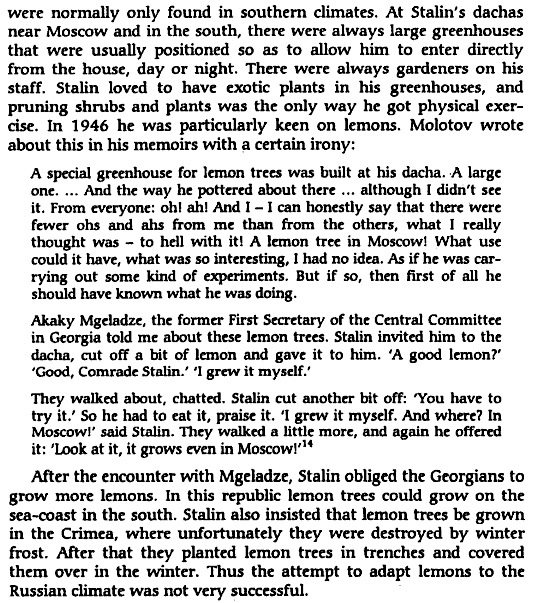 Did you know that Stalin only real passion, beside "hunting witches" was lemon growing. He had few in Sochi, of which he really took care. He used to send fruits to his wife, who was on rehab in Karlsbad , then Germany. There are hardy Mountain Tea varities. The Citrus Tradition of Russia is almost as old as that of Europe. The King of France was most proud of his collectiion of Citrus and of course gave plants to his fellow kings and other Pears. That way it came to Vienna, to the Medici and for sure also to Russia. The russian Indoor Citrus Culture is very rich and high developted. Almost all sorts are just for to grow indoors and need very little light and have no problems with hot dry air. Can you provide more info, please and were you have learn this from? Also, you have never been to a "Siberian farmer house", have you? So, making stuff up just to say something? I see. Frankly, I think this is quite childish. Back to the subject, the only Russian contribution to citrus-related business (I mean, before the 20th century) I'm aware of is a habit of chasing a shot (!) of brandy with a slice of lemon. By doing this trick in front of the emperor, Shustov (or Shustoff, if you prefer this spelling) could pretend that THAT face he made was because of a sour fruit, but not because of a low quality brandy his winery was producing. i do not know about other mediteranian countries, but many citrus sorts were brought to Dalmatia from USSR. First unshiu mandarins came as a gift of japanese emperor to Yugoslavia in 1933. After WW2 citrus trees were imported from USSR, Corsica etc.